Computer repair is such a simplified term to describe such a wide ranging variety of services that exist. Computer problems can range from monitors not turning on to software issues, hard drive problems, network malfunction, and to transferring and saving data properly. All these different repair services require different skill and knowledge. If you’re not sure what the heck is wrong with your computer when it starts to malfunction, the best thing to do is to take it to a computer repair center that deals with every aspect and issue with computers. 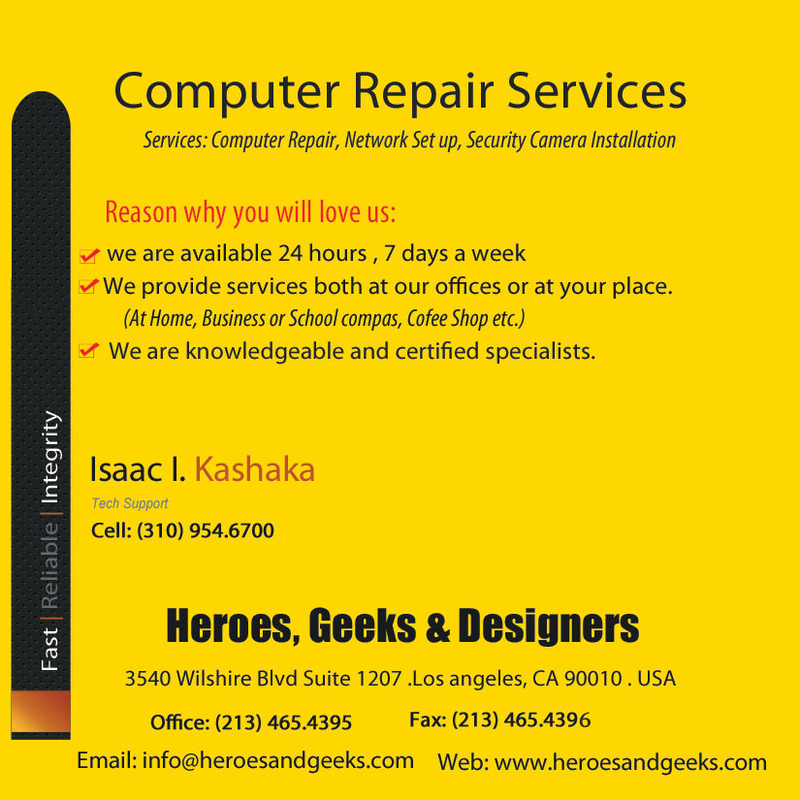 Heroes and Geeks computer repair services in Los Angeles is a one stop shop for all of your computer/tech related queries and problems. They have well rounded computer technicians that not only know how to fix the most common computer problems but also the rare and challenging problems. Be knowledgeable of the different services available to you so you know what services you need. Below are several services Heroes, Geeks and Designers offers. Troubleshooting and networking errors: These services are common and deal with installing your network connections and fixing problems that arise. Maintenance Services: In the computer and technology world, things are always changing and being upgraded, therefore your need to maintain your computer so its up to speed with the current software/programs/etc. Data recovery: A professional computer tech is capable of recovering any lost or virus damaged data, but if in the wrong hands, that important data can be permanently lost, so its very important to find someone who knows what they are doing. Virus removal/Antivirus: The Internet is a jungle, there are nasty viruses, spyware, and malware out there. Protect your computer and your valuable information by removing viruses and installing antivirus software. Hardware repairs: People make mistakes and somehow are capable of physically damaging their computer parts such as cracked monitor screens, missing keyboard keys, etc. most physical damage can be fixed. But if you have water damage to your computer, then most likely it is permanently damaged. Customization: This service has become less common these days due to the fact that computers are well equipped with large enough memory, and a variety of programs, so there is not much a demand for it. But if you wish to customize your computer parts to have certain features, make sure the tech provides you with proper stability when they make the customized changes. These repair services should give you an idea of what type of situation your computer might be, in the future when you come across a problem. Next time you need to Install, upgrade, setup, backup, transfer any software, network, data, computer program, or hardware, you know who to call. Heroes and Geeks offers a wide range of computer repair services in Los Angeles to ensure your computer problems will be a thing of the past. Stay tech savvy, my friends. Three things are certain in life, death, taxes, and advertising. In the past decade the world has become even smaller, this is mainly due to the World Wide Web which has made the world marketplace accessible with the click of a mouse. Selling on the Internet helps many businesses grow and expand, they have a larger audience than the usual walk-in customers. Every business on the web is competing for the same customers, this is where advertising, promotion and search engine optimization (SEO) comes into play. Without advertising your business will not be visible to the public, having a website alone will not bring foot traffic to your site, it is crucial to optimize your websites content if you want your business to stand out from your competitors. There are numerous search engine sites, but google is the number one search engine used by every person, so much so that “google it” has become a coined phrase. Being on the first page of google and other search engines is very beneficial to your business’ growth and visibility to the masses. Here are several benefits of SEO for your business. If you’ve ever searched something on google, you know there are more than 10 result pages for your searched term, most people don’t go past the 5th page at most. This is where optimizing your website will guarantee that when someone searches your keywords related to your website you will be listed in the top first pages. Optimizing your website will bring in targeted traffic to your website which will result in your business outcompeting your rivals. Once your website is optimized and its being viewed by the masses, people will start purchasing your products. The more traffic you get to your website the more sales that take place. When you website is being advertised and is on top of the search engine results this will surely create sales for your business. When people have an easy time finding the products they want to purchase, they will more than likely buy. Promoting and marketing your business online is key for E- Commerce business. Some SEO related work is DIY, like all the social networking to promote your website and business and it costs you nothing but a few minutes of your day. Although that doesn’t land you on the first pages of search engines it’s still good ol’ promotion that costs you nothing. Hiring an SEO specialist can also be affordable, it’s just a matter of hiring the right one which provides the most value. The SEO market is very dense therefore prices are very competitive. People buy into SEO, when they see a business on the first few pages of a search engine they will more likely trust and purchase products from the first search results. the results that are further back in the pages don’t get viewed, even if they are reputable and valuable results, people think they must not be as important or good if they’re not on the first few pages. When your business ‘ website becomes searchable and more visible to people and search engines it becomes more desired and recognized and will consistently be on the first few pages of search engines. When your business implements SEO techniques, your online presence will grow and attract more customers to your website. People are always tricked by advertising and also want instant results rather than to continuously search page after page for results. If you want your business to be on top of search engine result pages you must implement a SEO strategy. The benefits are endless and worth every penny. People are looking for your business so why not help them find you to help your business grow. Computers are machines therefore can result in damage and break down, humans are not perfect therefore can cause mistakes, these two factors alone can result in loosing computer data. Nobody likes to lose their personal data, especially since nowadays there is a lack of a hard copy, since everything is going the digital route. This is also the case for both large and small businesses which can suffer productivity and security if there data is not properly safe and secure. There are several things that contribute to data loss, these include computer viruses, hardware and or software problems, power surges, network errors, etc. There are preventable measures one can take to avoid these problems from happening, but people only think to do something once a problem has occurred. That’s why data recovery services are available to help restore any lost personal or business data. Losing data for a business is a major setback, it will stop production and cause frustration. There are three groups of data storing devices, these include: Databases, digital data storing devices, and business storing devices. Fortunately nowadays data recovery services are available to service and restore those different types of data storing devices. The types of databases which data can be stored are SAP, Oracle, SQL, Fox Pro, Microsoft Access, and MySQL. Some digital data storing devices include, cell phones, laptops, PCs, DVDs, digital cameras, etc. Then business storing devices include, data archiving systems, SAN, server drives of both Linux and Windows systems, data storage arrays, etc. As you can see there are many places where data can be stored and hiring the most qualified data recovery specialist will help restore any data to its exact previous state even if there is high encryption. Search for the most genuine and competent specialist- ask the service provider as many questions to walk you through the process, this will indicate if they know their trade and are qualified to recover your data. Ensure your data is protected- ask the service provider what their privacy policies are. You should want to hire someone with integrity and has your best interest at heart. Be Cautious of a flat rate pricing. Not all data recovery processes are the same. For example, a business data recovery would require more time and expertise then when recovering personal data from a digital data storing device. There are different amounts of data that need to be restored therefore the pricing can’t be a flat rate. If you want to protect your personal information and restore your very important data, then it is very important you keep in mind those tips when shopping around for data recovery services. Do you want cameras indoors or outdoors or both? Will you use the cameras during the day, night or both? How far and wide do you want the camera to view? Do you want high resolution or standard? Are you in need of an infrared camera? Do you want to sync the recordings with your TV, Smartphone, computer, and other technology? Knowing the answers to these questions will determine the type of security and cost of the service. Also a technician can help to find the right service for your particular needs. The different styles of security cameras include dome, c-mount, infrared, and prices range from $60 to $270. Complete security camera kits are a set of usually 4, 8, 12, or 16 cameras that are connected either wirelessly or wired to a recording system such as a DVR, which then is able to be displayed on a monitor. It’s becoming more common now to have the video monitoring systems connect using the computers Ethernet or wifi network that already is in the home or workplace. Than that allows smartphone apps to control your surveillance anywhere you are. Thus creating peace of mind wherever you go. Although the cost of security camera installation is a high upfront cost, in the long run it is worth every penny for the insurance it provides to keep your home and or business protected from crime. The demand for computer repair services is growing rapidly, statistics show that every two out of three households has a computer or similar device in America. Metropolitan areas like Los Angeles luckily have many options when it comes to choosing computer repair services. The city of Los Angeles has the largest number of listed computer repair service providers than any other city in California, which is understandable since it has the most dense population. Choosing the best computer repair service in Los Angeles and any other city can be difficult. Here are some guidelines to help you make a good choice. Cost of Services – The cost of services should be reasonable, if the prices for service are too low, then it’s probably too good to be true. If the prices are too high then you’re being overcharged for services that can be easily done for less. So shop around and look for a median price range. Licensing and certification – It is very important to know that you are working with a licensed professional, make sure they have their licenses and certificates posted in their store. Reputation of Repair Store – Find out the reputation of a repair store through websites that rate service based businesses, such as yelp and Angie’s List, as well as the Better Business Bureau. Warranty offer – The repair service provider should offer a warranty on any computer repair both on hardware and software repairs. This guarantees their confidence and quality in their work. Past customer reviews – Search for customer reviews as a guide to the type of services the repair stores provide and to find out the problems or great service they might provide. 1. Value– you want a service provider that offers good quality service for a fair price. 2. Integrity– a personal computer is very personal. You want a repair shop that is honest and protects your information. 3. If the computer repair service has the above two qualities, everything else will be taken care of. The number one way to find a good trustworthy repair service is through personal referrals. If you can’t get a personal referral the next best thing is to look up reviews on websites like Angie’s List and other similar service review based websites. These guidelines will help you to choose the best computer repair service provider. What is a Computer Virus and Malware? At one point in time if you’ve ever used a computer you have encountered a computer virus or malware of some sort. Just like a human virus copies itself and spreads, a computer virus or malware is a harmful software that spreads by duplicating itself and attaching to other programs and computers. What many people don’t know is that there are several different types of infections that are categorized under malware, which stands for malicious software. These varying computer viruses and malware softwares are created by virus authors who are in the same category as an arsonist or a vandal, they don’t really have a goal for creating the harmful software other than practicing their programming skills and being a menace. Trojan Horse– is a malicious software that hides in disguise as a real program. Spyware– spys on your internet activity and changes your computer configuration and it installs on your computer without your knowledge. Rogue security software– this is a tricky malware that has the user interact. This software has the user think they have an infection and then prompts them to buy and download antivirus. It can cause certain programs on your computer from opening. Worm– Worms cause unstable computer and network problems. They are a computer code spread through email attachments and don’t require user interaction to spread.. In order to remove a computer virus you will need to have the most up to date anti-virus software installed on your computer. There are several kinds of anti-virus software available, some are free and some are commercial anti-virus programs which have a short free trial period that allows you to scan and clean your computer. A few of these antivirus programs include; ESET Nod32, AVG, Norton, Bitdefender, and Microsoft Security Essentials. For extra security measures you can install MalwareBytes Anti-Malware, and SuperAntispyware. These programs are excellent for scanning your computer and finding the latest malicious software that the most common anti-virus programs miss. Prevention is the best protection against computer virus and malware. First and foremost have the latest Antivirus program installed on your computer. Secondly, be cautious on the web, only download programs from trustworthy websites, be cautious of popular sites that allow free music and movie file-sharing programs, and when reading emails, keep your contact list current and only open messages from people you know. Also, turn on Firewall, and keep your computer up to date. Follow these preventions and your computer will be infectious free. Computers have become a critical part of our daily life, at home and in the office. They have become our third arm and made the world an even smaller place. It started out as a simple machine and now has the world market at our finger tips. The computer has transformed the way people socialize and share their life stories, it has changed the way we shop, and also developed a more efficient way to communicate and perform business with people. This useful machine has made it difficult for us to live without it, which is why everyone wants to make sure there ‘life in a box’ is always in the best condition and continues to work at all times. However, there is no guarantee with electronics which are susceptible to problems from the physical and internal elements. That is when you will need a Los Angeles computer repair service provider who can resolve the problem in efficient time to help you resume your office work and personal life. When your computer acts up and encounters a problem, only a skilled technician can help you to remedy the problem using correct diagnostic methods. To find the best computer Repair Center in Los Angeles, first start with research. You want to look for technicians who are well versed in the trade; you can find this out with online reviews and even referrals. If you want good quality work, you have to hire the most qualified tech. You should research for repair Centers that are within your locality, which will make it more convenient and accessible for you. Once you find a business that offers computer repairs, look through their website and find out if they provide the services you need. Then call up the Center to find out the details of the work they will provide, the cost of the repair, and their technicians skills. You should also discuss their ethics policies, since they will have access to your personal information, you will need to protect yourself. It’s also best to shop around to compare pricing and work quality before signing up with the first repair Center you find. For the average computer user trying to pin point the exact issue or reason for the computer system failure is almost impossible, because they are the user and not the problem solver. The only thing they can do is to call the Best Los Angeles Computer Repair tech and wait for them to solve their problems. To prepare the computer to take to the repair center, first try to back-up any important data, since usually repair Centers are not liable for lost data. Then turn off the computer and disconnect it from the power source and all the input and output cords. Then bring your computer to your nearest repair Center with all the log-in information and then give your computer to the authorized personnel. With many businesses going mobile, computer repairs going mobile does not come across as news. Computers have held man close to technology and made life more leisurely. It has eased up a lot of processes that were earlier done manually. Computers have actually made humans lazy to a great extent, with computer memory banks getting bigger, the human memory is getting smaller. Computers save us time and give us instant answers, life without computers has indeed become impossible even to imagine. Given this, it is strange that most people feel that technology doesn’t need any care or up keep. There are many people who do not bother to take care of their computers or keep up the maintenance from time to time. Most people feel that this non-living thing can work an entire life without any service. Then they complain and shout at the computer merchant when there is a problem. Their thought is technology is a solution to the problems and not a creator which in turn makes them think to buy new computers rather than fixing the problem. Whenever a computer gives problems to any person, they tend to visit the repair stores. Most repair stores have computer experts who diagnose the problem first which can take 2 to 5 days before giving out the solution. But, in most cases people don’t have that kind of time to leave their computers at the computer repair stores. This is the basic reason for mobile computer repair services. With the mobile services made available, the computer experts visit you at your home or business. These experts come prepared to diagnose the issue that your computer may be facing and then fix it on the spot without taking days like a traditional repair store. At times, providing mobile computer service can be unpredictable. Some diagnostics may require tools, equipment or parts that are not on hand due to the nature of the unique computer problem a customer might have. This will require the computer tech to finish the repair on a second visit, in most repair service cases though both the diagnosis and repair are accomplished in the same visit. In some rare cases if a tech is having a trying time with the repair at your home or shop, it is at this point when they offer to take your PC to the office to work on and deliver it back once the issue is solved. The mobile computer repair services gives options to customers, they can choose to drop off their computer at the computer repair office or they can choose to have a tech go to them to diagnose and fix. The customer also gets to choose for diagnostic service only which will be a flat 35$ fee or and a repair service which prices vary depending on the issue. The techs understand how important the computer and the data within it are for you and will provide good and timely service. If you choose to go with a repair service store; first do some research, look at reviews, know the services they provide, and ask for a quote. You should always ask for a quoted price and number of days needed for the repair. Make sure you know the budget of the repair and, make a deal that it does not go beyond that. You should be aware of the hidden costs as well. Technology serves you from time to time, making life easier. Be it giving you some data or entertainment on time, technology is always there for you. From computers to internet to mobiles, the world has grown tech-savvy in many ways. Most of you would wonder how people worked when there was no Microsoft in the world, writing documents manually is unimaginable. It’s hard to believe there was a time when people communicated without the internet or cell phone. It is indeed strange how fast humans have become accustomed to the existence of technology, we can’t imagine living without it. When it comes to technology and computers one has to maintain it to sustain it. The way technology serves us, it is our duty to serve technology every now and then. If you have a computer at home, it is very necessary to perform a regular clean-up of the registry files and other details on the computer. This would enable a faster service and make technology serve you better. The cleaner your computer remains, the faster it would work. As with every technology, computers undergo major issues sometimes. Whenever you feel your computer is not working, it is better to go to the computer repairs store and get it diagnosed. At times, you might feel too lazy to go out and, get it serviced. But, remember if the problem is sorted out at the earliest, it won’t magnify into a major issue. The repair store has experienced techs who offer help right from diagnosing the problem to solving it. They would walk you through the major problems you might be facing with your computer. One common issue that most computers face is irregular servicing and clean-up. Once the problem is diagnosed, the solutions are offered to you by the techs at the repair store. The solutions offered include the rate quoted for each of the solution. You need to figure out the solution that works best in the budget you are keen to work-out for your computer. At the computer repairs there may be issues that the techs would claim as impossible to solve or to damaged. In such cases you would have no option but to get a new computer. Make sure before you choose a solution being offered, you have asked a few questions to the person who is handling your computer. If there is a solution, you should know the cost of the solution. The quoted price would be a rough one. Sometimes there can be a huge mismatch in the quoted price and actual price. So, make sure before choosing the solution you are aware of the exact price. You should also be aware of the exact number of days that the techs would take to repair your computer. Hidden costs are the troubles of the present times. Make sure you enquire about the hidden costs if any. Unless you are aware of the exact nature of the problem and solution and also the cost of the whole work needed to be done, do not agree to the service. Servicing your computer regularly can prevent it from failing on you when you need it most.